Travellers can spend months planning every detail of their dream trip but along with sunburn, getting bitten by insects is the most common mistake we make. Researching and buying the right repellent for your destination is often not as high up the priority list as it should be. In the UK and Europe we have insects that tend to annoy and irritate rather than cause us harm, think the infamous Scottish midge. However, mosquitoes and other biting insects in more exotic destinations have very real and potentially fatal risks. Malaria, West Nile Virus and Yellow Fever are just some of these diseases. None can be vaccinated against and none have a cure so preventing getting bitten in the first place is vital. Insect repellents are substances that are applied to skin which deter insects from landing and biting, they are commonly sprays. There are three types of insect repellent approved for use in Europe. These are DEET, Icaridin (Saltidin®) and Oil of Lemon Eucalyptus Oil (Citriodiol®). DEET is a powerful substance, generally considered to be the most effective, broad spectrum insect repellent available. DEET works very well with most insects that are trying to bite you! Exceptions are spiders, ants, bees and wasps. It has been widely used as a repellent since 1946 when it was developed by the United States Army following its experience of jungle warfare during the Second World War. There is a significant amount of data and evidence backing up its effectiveness and safety. DEET can be bought in a range of strengths. The highest concentrations are for use in tropical areas, where there is a high risk of disease carrying insects. The lowest 20% strength can be used for very effective protection in less challenging, European and non-Malarial areas. DEET insect repellent can damage some synthetic fabrics, plastics and leather if sprayed directly onto these surfaces. This can make for an annoying loss of the favourite flip flops or sunglasses so care should be taken when applying the product. The best way is to apply the spray without rubbing it in (to prevent the liquid getting transferred to your hands and then your belongings). The liquid should be left to dry before putting on sandals or jewellery and this will usually prevent any damage. If using with children, always check the label to see if there are any instructions with regards to age of use. The repellent should always be applied by an adult. DEET has been widely used for many years and it is an incredibly effective insect repellent. It does have some disadvantages and a milder alternative may be better for European destinations. Anyone travelling to a high risk part of the world would be foolish to leave home without a deet insect repellent. Saltidin® (also known as Icaridin) was developed by Bayer as an alternative to DEET. Many people find it more pleasant to use. It does not damage synthetic fabrics and it has a nice feel on the skin due to it being less oily compared to DEET. It was first used in Europe in 2001 so this is a relatively new repellent. It works in the same way as DEET by blocking the insect’s olfactory receptors. It has been found to be as effective as DEET in lower concentrations, however it is still recommended that DEET be used in high risk destinations. As with DEET, Saltidin works very well against flying insects that are intent on biting you, less so with spiders, bees and ants. It is a gentler product to use than DEET and is classified as less toxic and less of an irritant. For children even the highest concentrations can be used from the age of 2. Citriodiol® is the name used for a substance that is made from the Oil of Lemon Eucalyptus plant. This is the third and final active ingredient that is approved for use as an insect repellent. Its main advantage is that although it is a strong repellent, it is an all-natural product and a good alternative to DEET. This makes it particularly attractive to families with young children. Plug in insect repellent, candles and bands are available but offer much lower protection against biting insects than sprays. Insect repellent bands can work well in low risk areas and are particularly useful if you are looking to avoid using repellent sprays on skin for example if you have young children. They should however never be used solely to protect against bites and never in high risk areas. Candles and plug in’s work by releasing a gentle Citronella aroma or permethrin vapour into the room to either deter or kill insects. These are good products to have in your arsenal as added protection, but they will never be able to provide the same level of protection as a repellent sprayed directly onto the skin or by using a treated mosquito net. Their effectiveness will also vary depending on the size of the room and the number of insects present. 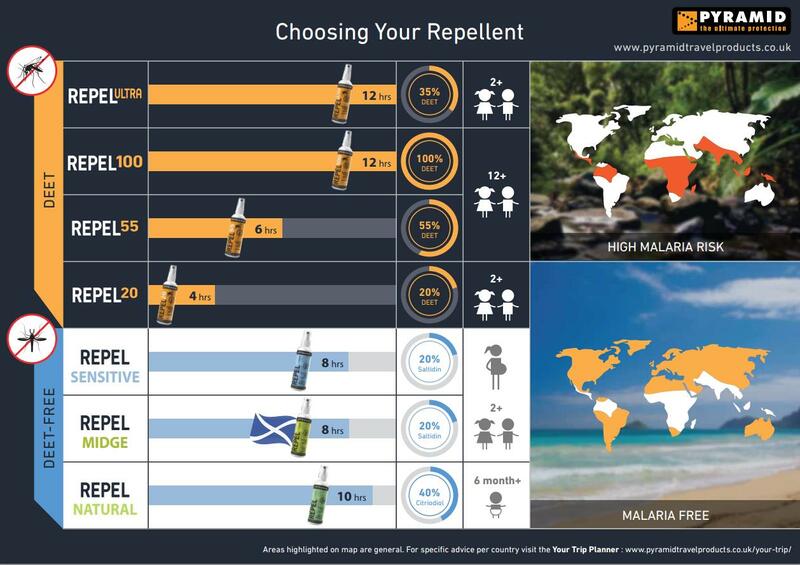 The type of repellent you choose will depend on what country/countries you will be visiting. If you are staying in an area with a high risk of insect-borne disease, you must sleep under a quality, permethrin impregnated mosquito net. A treated net is 10 times more effective than an untreated one at deterring and killing mosquitoes. Wear loose, long sleeved clothes. Mosquitoes are much more attracted to dark colours so wear light colours. Avoid wearing perfume or aftershave as they can attract insects. If visiting a midge prone area, remember they are much smaller than other flying insects and so head nets and hats need to be made of a much finer material. Avoid standing near stagnant water and shady wooded areas where mosquitoes tend to breed……and bite. Find out more about Pyramid Insect Repellents on their website or shop Pyramid Insect Repellents.